Belt Tensioner Wheels & Bkts. Mirror Heads, Housing & Motors. UK Reg No/Vin MUST be supplied. The compatibility is only a guide. A UK Reg or VIN number MUST BE SUPPLIED as in many cases there is a "choice" depending on chassis numbers. We cannot be held responsible if this is not supplied or is supplied after despatch. Voltage [V]: 12 Number of Teeth: 9 Rated Power [kW]: 1.4 Rotation Direction: Clockwise rotation Number of Thread Bores: 2 Number of mounting bores: 2. Any of the brands above, equivalent or OE supplier brands may be supplied UNLESS customer specifies. OE Part Number (or Equivalent). BOSCH : 0 986 010 650 , BOSCH : 0 986 013 600 , BV PSH : 810.003.092.415 , BV PSH : 810.003.092.510 , BV PSH : 810.503.092.010 , BV PSH : 810.503.092.210 , BV PSH : 810.503.092.215 , BV PSH : 810.503.092.311 , CASCO : CST10109AS , CASCO : CST20131AS , CASCO : CST20131RS , CEVAM : 3586 , CEVAM : 8174 , DA SILVA : 020251 , DA SILVA : 026025 , DA SILVA : 026085 , DRI : 338001092 , DRI : 338111092 , DRI : 338122092 , DRI : 338140092 , EAA : EAA-121114 , EAA : EAA-121192 , EAA : EAA-121310 , EAA : EAA-121373 , EAA : EAA-122259 , EAA : EAA-122960 , EAA : EAA-122961 , EAA : EAA-123394 , EAA : EAA-123395 , EAA : EAA-123396, EAA : EAA-123396 , EAI : 11420 , EAI : 11424 , EAI : 11517 , EDR : 910650 , EDR : 913600 , EDR : EF10063 , EDR : EF10560 , ELSTOCK : 25-0126 , ELSTOCK : 26-0435 , ELSTOCK : 26-0464 , ELSTOCK : 26-1446 , ERA : 220008 , ERA : 220061 , ERA Benelux : RE8852N , EUROTEC : 11010650 , EUROTEC : 11013600 , FARCOM : 103081 , FARCOM : 103213 , FRIESEN : 8010650 , FRIESEN : 8013600 , HC-Cargo : 110160 , HC-Cargo : 111054 , HC-Cargo : 111489 , HELLA : 8EA 012 526-871 , HELLA : 8EA 012 526-872 , HELLA : 8EA 725 990-001 , HELLA : 8EA 726 052-001 , HELLA : 8EA 726 137-001 , HELLA : 8EA 726 458-001, HELLA : 8EA 726 458-001 , HERTHBUSS ELPARTS : 42013600 , LAUBER : 22.0140 , LAUBER : 22.0292 , LAUBER : 22.0389 , LUCAS ELECTRICAL : LRS01983 , LUCAS ELECTRICAL : LRS02127 , LUCAS ELECTRICAL : LRS02136 , MAGNETI MARELLI : 943251223010 , MAGNETI MARELLI : 943251426010 , MAGNETI MARELLI : 943251454010 , MAGNETI MARELLI : 943251633010 , MAGNETI MARELLI : 944280106500 , MAGNETI MARELLI : 944280136000 , MAHLE ORIGINAL : MS 266 , MAPCO : 13955 , MESSMER : 220008 , MESSMER : 220061 , PIM : 60840260 , PowerMax : 88212579 , PowerMax : 88212849 , PowerMax : 88213159 , PRESTOLITE ELECTRIC : 20500729 , QUINTON HAZELL : QRS1112 , QUINTON HAZELL : QRS2212 , REMY : DRS0650 , REMY : DRS3600 , REMY : RAS34711 , SANDO : 6010109.0 , SANDO : 6020131.0. Any of the brands above / below, equivalent or OE supplier brands may be supplied UNLESS customer specifies. BORG & BECK, FEBI, VIEROL, Or-Equivalent. Please see our full T&C. If you have any problem with your order, please give us a chance to put it right for you by contacting our Customer Service Team. We always aim to reply to all messages within 24 hours. Help is available Monday to Friday from 8.30am to 5.30pm, and on Saturdays from 8.30am to 1.30pm. 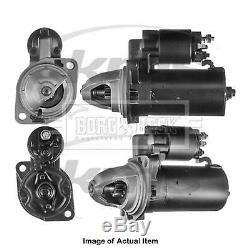 The item "New Genuine BORG & BECK Starter Motor BST2390 Top Quality 2yrs No Quibble Warran" is in sale since Monday, April 8, 2019.